Come and scoff top notch nosh (try saying that after a couple of gins) in Somerset and Dorset – at the same time – at The White Post near the tiny village of Rimpton. More or less equidistant between Sherborne and Yeovil, the pub actually straddles the two counties. 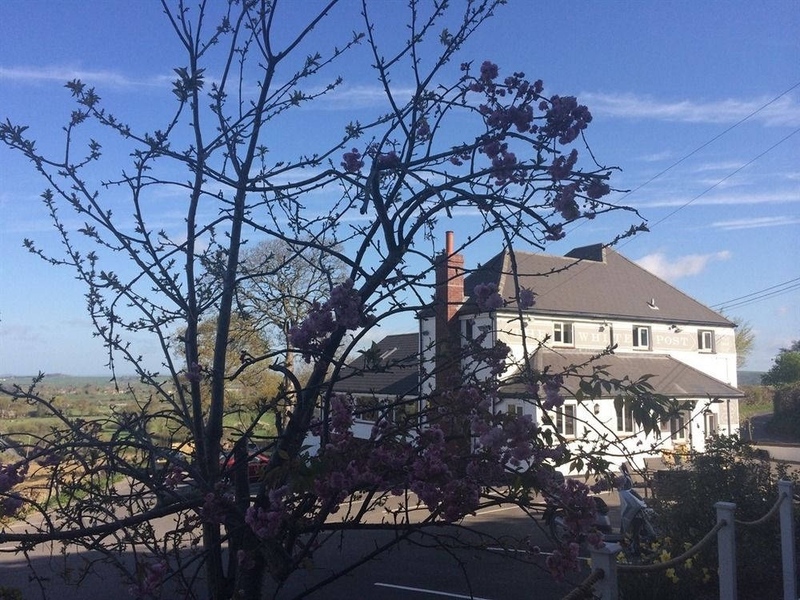 It might look a little bit stark on the outside but inside, chef Brett Sutton and front of house, wife Kelly, are cooking up a storm: The White Post’s only been open a couple of years but it’s already in the Michelin Guide, has won numerous regional awards and most recently was listed as one of the UK’s Top 50 Gastropubs 2017. 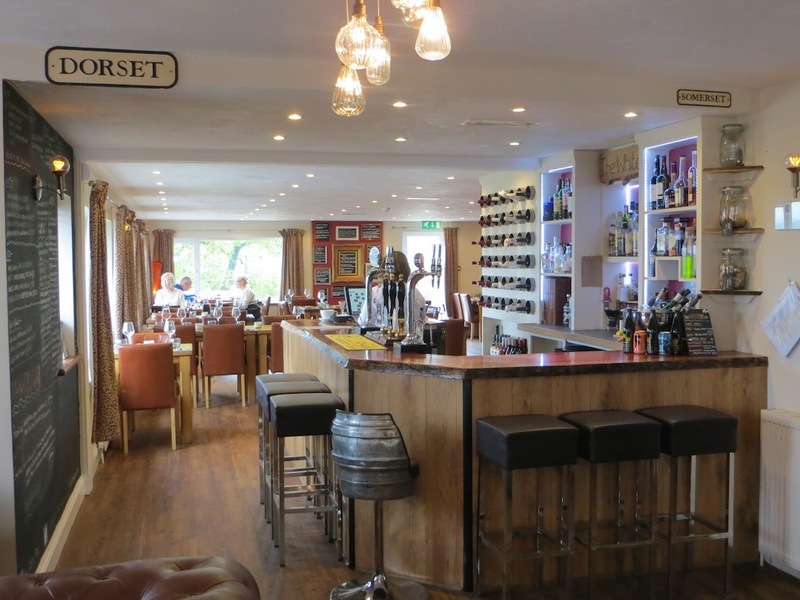 It’s got a restaurant rather than a pub vibe. Yes, there’s a bar with some squashy sofas at one end, serving local (that’s Somerset and Dorset, of course) ales and ciders, all kinds of spirits and an extensive wine list, but unless you’re a local, you’re more likely to be knocking back a drink there before you sit down to eat rather than settling in for a night of heavy boozing. 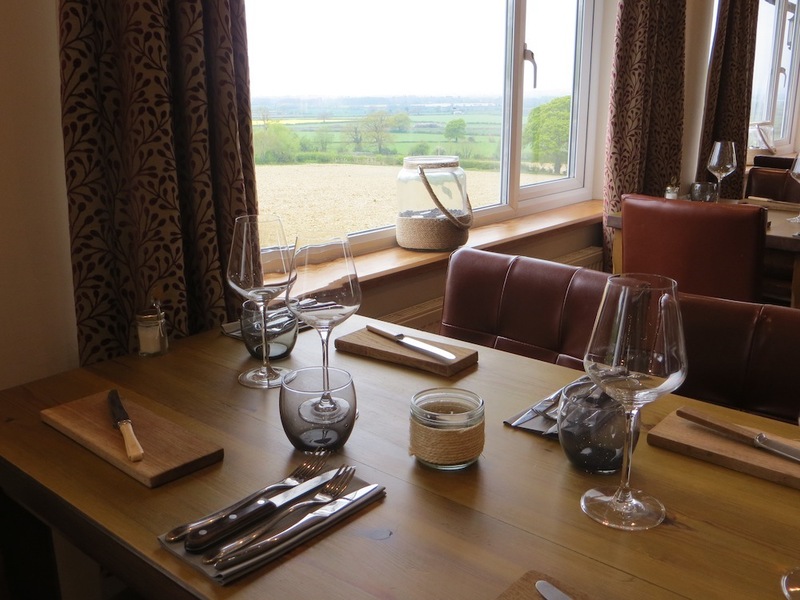 Window tables look out over pretty countryside but go early to nab one, as it’s first come, first served It was a grey day when we rocked up one lunchtime but the sunsets are said to be spectacular. Brett was set to become an accountant before a part-time job as a kitchen porter set him off in a foodie direction. He’s earned his chops in quality kitchens all over the UK, reached the finals in the prestigious Roux Scholarships cookery competition many times, and was head chef of Dorset’s The Eastbury before he and Kelly took on The White Post. 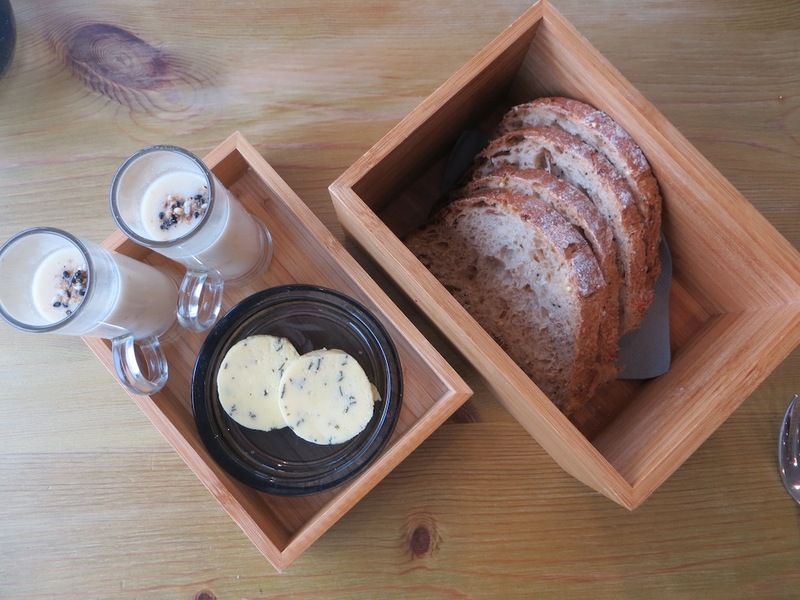 Sign that it’s a cut above: Kelly arrived with a complimentary amuse-bouche – a mystery box which revealed gorgeous homemade bread and herb butter to go with little glasses of lightly spiced cauliflower velouté. Every diner gets one, even those who’ve stopped by for a glass of wine and a starter as a light lunch. The food is beautifully presented – yet not self-consciously – and generously portioned. On the lunch menu there was a choice of six starters, including a coronation chicken and quail terrine, a marinated and torched mackerel and some grilled asparagus with ‘Somerset style’ feta. 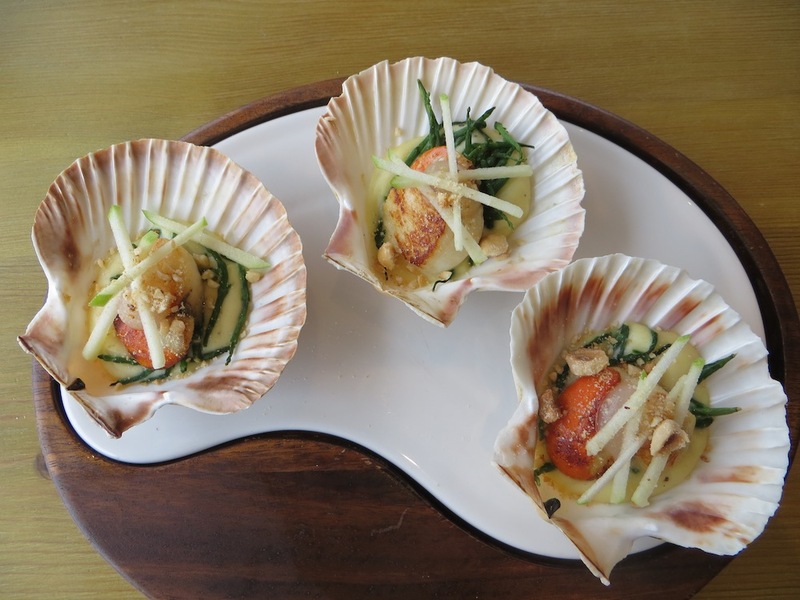 We had the roasted – and oh, so sweet and succulent – Lyme Bay scallops, lying on a bed of celeriac puree and samphire, topped with matchstick Granny Smith apple and crushed hazelnuts. Scrumptious. 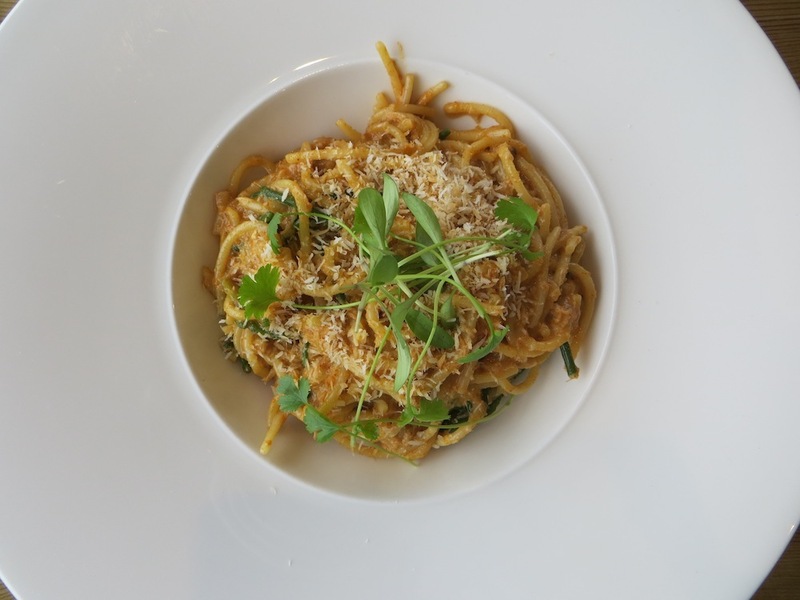 The spaghetti of Dorset crab with Thai spices, coriander cress and roasted coconut, was deliciously enough as a standalone lunch. Onto the mains. Unlike some gastro places where the menu’s pared down to a choice of just a few dishes for each course, here it’s quite large, with five ‘main’ mains (two meat, two fish, one veggie), plus a steak (45-day matured), a huge mixed grill to share (beef, lamb cutlets, kidneys, black pudding, a pair of duck eggs – the works) as well as their take on ‘pub stuff’ including a sausages with bubble & squeak, a burger and pie of the week. 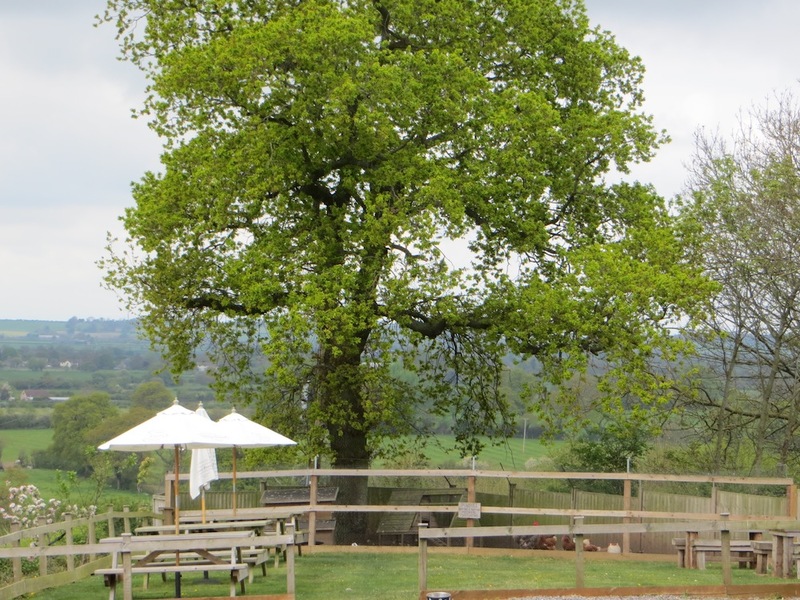 Sundays has a separate menu, including an all singing, all dancing sharing board. 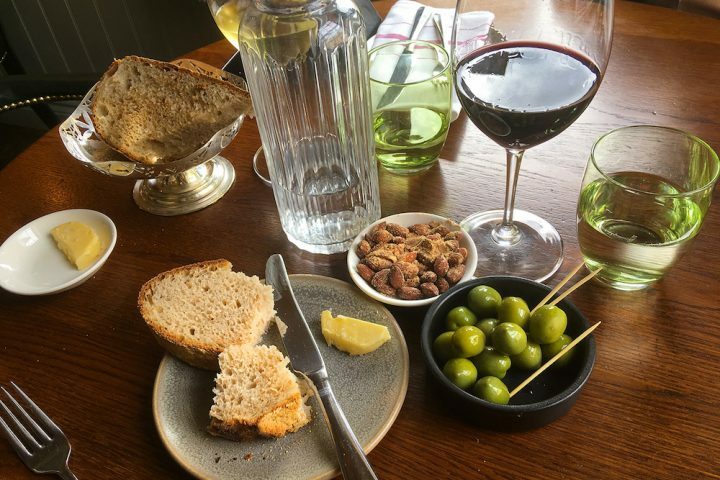 Whilst at some establishments, this could be a warning sign that things might not be that great, here at The White Post, it just means that you could come every day for two weeks and eat something different – and fabulous – every single time. 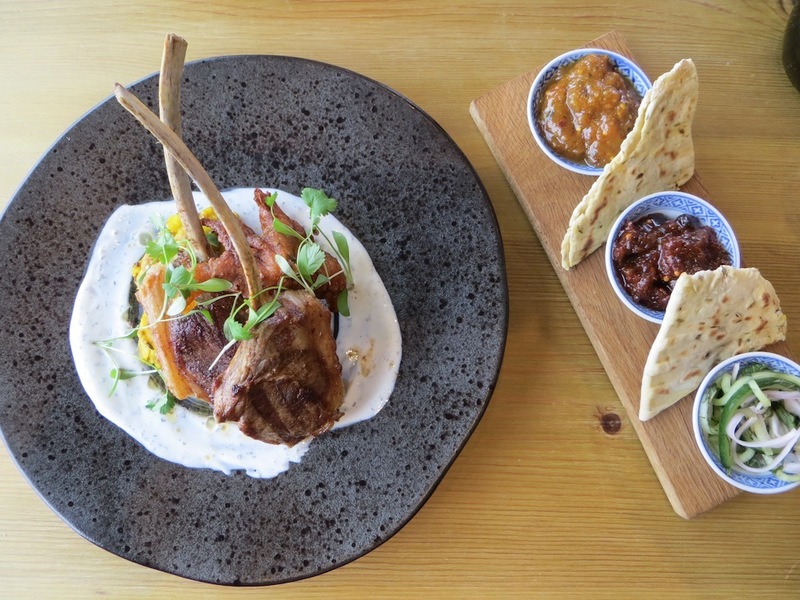 These impressively upright tandoori lamb cutlets came with a carrot bhaji and yoghurt along with spiced shoulder flatbread and homemade chutneys and mint salad. Yum. 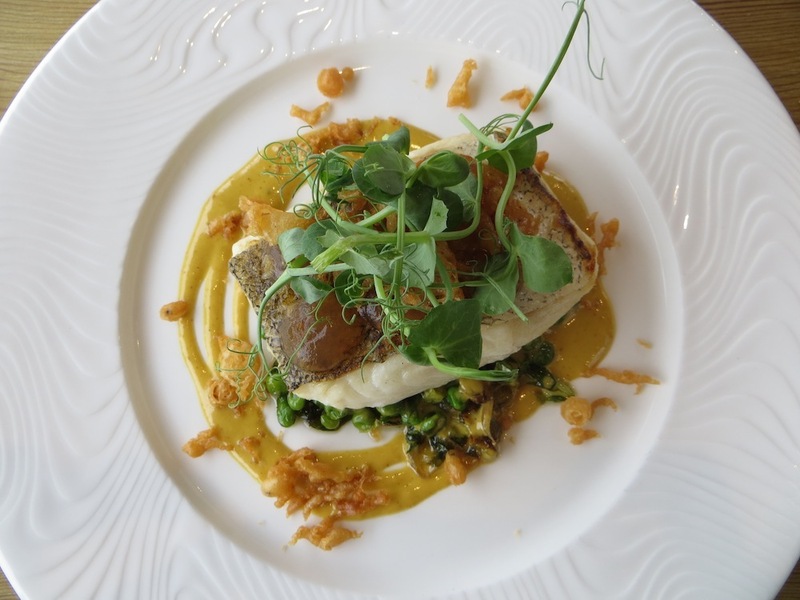 This seemed to be the White Post take on classic fish and chips: roasted hake with peas, baby gem lettuce, a curry sauce with battered scraps and dripping cooked chips and, a clever touch, a dollop of malt vinegar gel on top. The hake was cooked to perfection: firm, moist and flaked easily away. I’m a chunky chip, get me outta here! Come dessert time, you’re spoilt for choice. 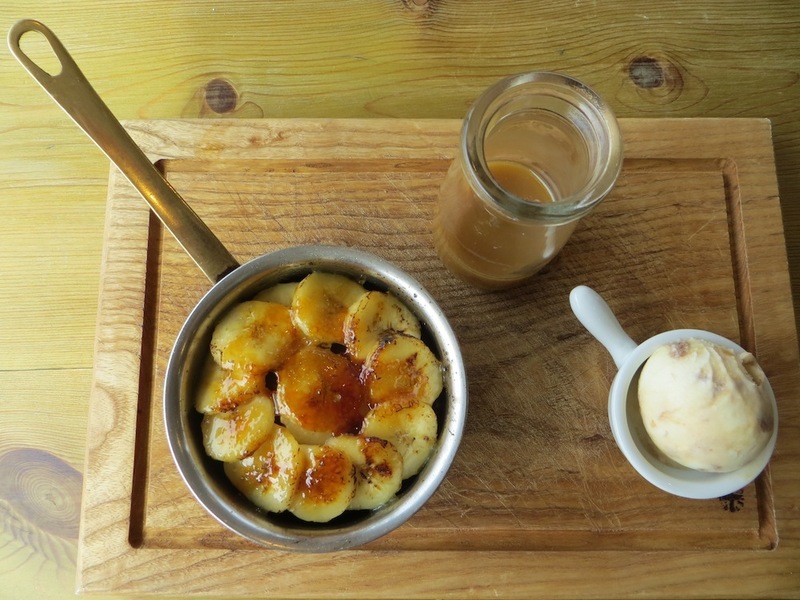 After much deliberation, the sticky toffee pudding arrived, topped with a layer of caramelised bananas, and served with honeycomb ice cream and a butterscotch sauce (yeeeeeesss!). 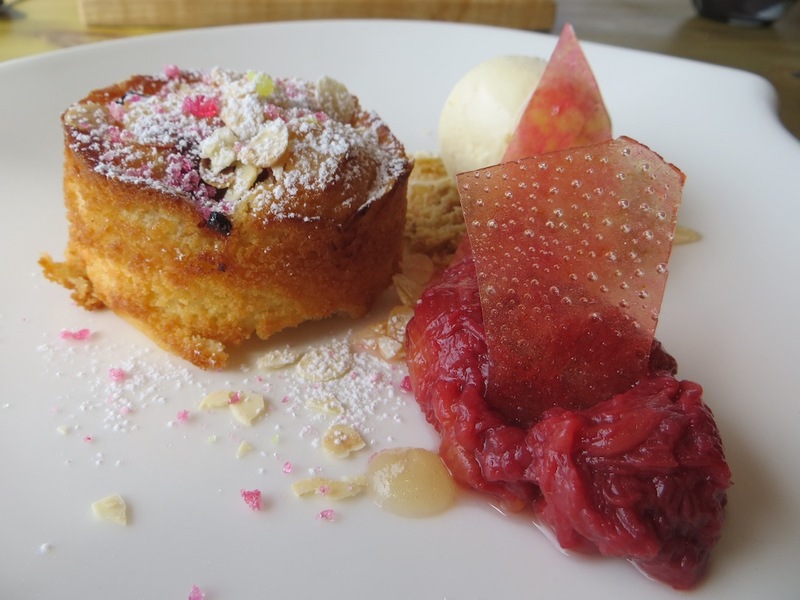 Rhubarb and toasted almond cake with rhubarb ice cream and rhubarb glass – stunning to look at and an out of this world flavour. My mouth’s watering at the sight of it. 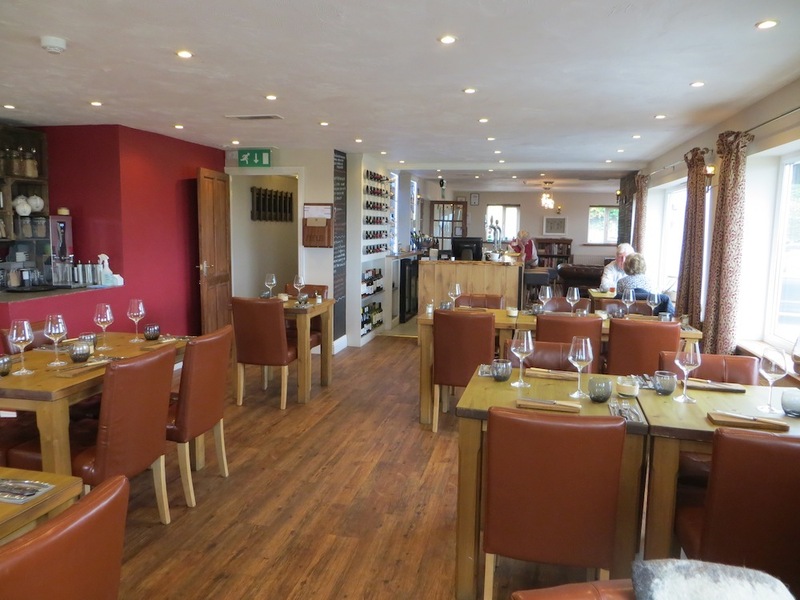 Outstandingly good food, beautifully presented, cooked up by a laid back chef with his finger on the pulse, with friendly, efficient front of house. Good for: Anyone who appreciates fine dining. 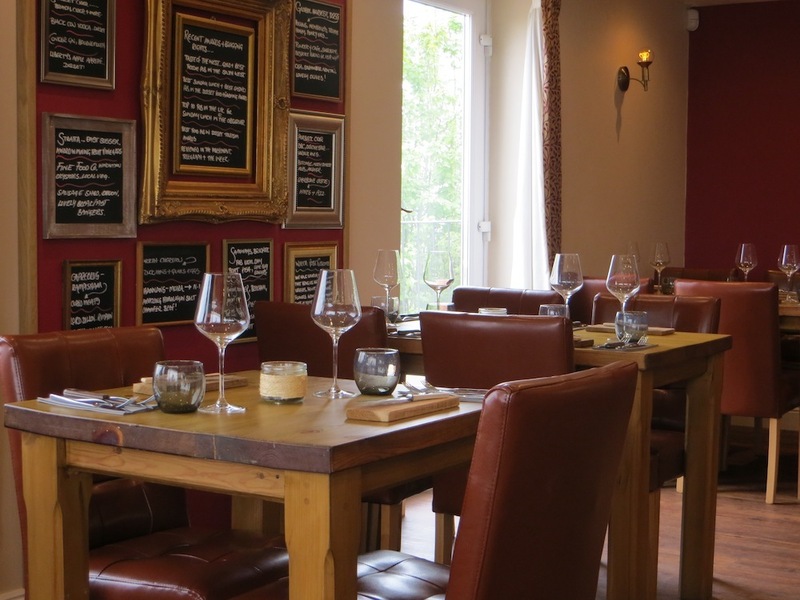 Come for a midweek/Saturday lunch – just one course or the whole caboodle (and why not? 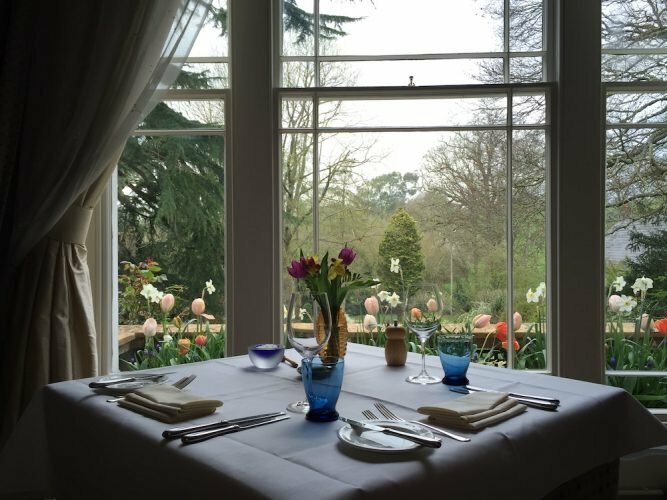 You’ve probable made a little bit of effort to get here) – for dinner with friends, your sig other, a celebration, Sunday lunch with the whole family. 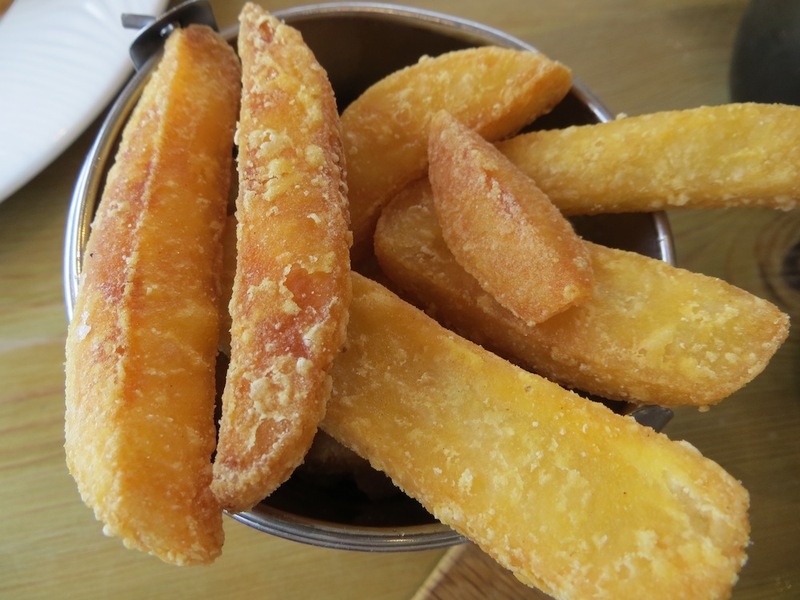 Kids are welcome; they can choose off the main menu or the kids’ (Brett and Kelly have youngsters and know what they like – White Post style). Not for: Can’t imagine anyone who likes great food not liking this place, though if you were seeking an intimate corner to whisper sweet nothings, I didn’t notice any. £££: Moderate. Starters £8.50-11; ‘main’ mains £15-£22, though the pub dishes are cheaper at £8-£14.50. The mixed grill board is £52 for two to share. Desserts, £6-£7.50l; cheeseboard with some interesting cheeses, damson jelly and truffle (!) honey £10. Opening times: closed Monday; Tues-Sat 12pm-3pm (food 12-2) and 6pm-close (food 6.30pm-9pm); Sun 12pm-3pm (food 12pm-2.30pm). There are three rooms if you want to stay the night and try out their breakfasts the next morning (please let me know in the comments box below if you do). Really pleased to note that they leave the roe on the Scallops. This just does not happen now in the majority of so called “Fish” restaurants. 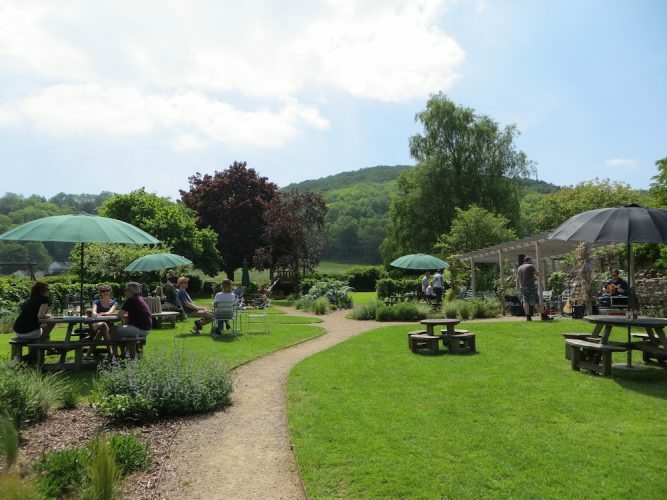 Will try this place next time I am in the West Country.